Century Cycles Blog: Take 20% OFF all Thule car racks for Thule Days - now thru May 29! 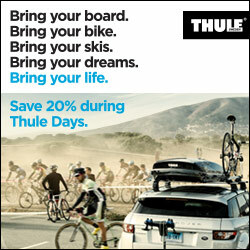 Take 20% OFF all Thule car racks for Thule Days - now thru May 29! Celebrate Thule Days May 19 through May 29, 2017! Take 20% OFF all Thule car racks, child trailers, and baby seats! Go to www.centurycycles.com/get/thule to see our full selection at all three Century Cycles stores!